On photographer W. Eugene Smith’s unseen opus. On September 2, 1958, W. Eugene Smith’s passport was stamped at the airport in Geneva, Switzerland. Hired by General Dynamics, he was there to photograph the United Nations Conference on Peaceful Uses of Atomic Energy, known as “Atoms for Peace.” He was to be paid $2,500 for two weeks of work (about $20,000 in 2014 money), plus a $20 per diem. Commercial work wasn’t Smith’s preference, but he needed the money. He needed some distance from New York, too. 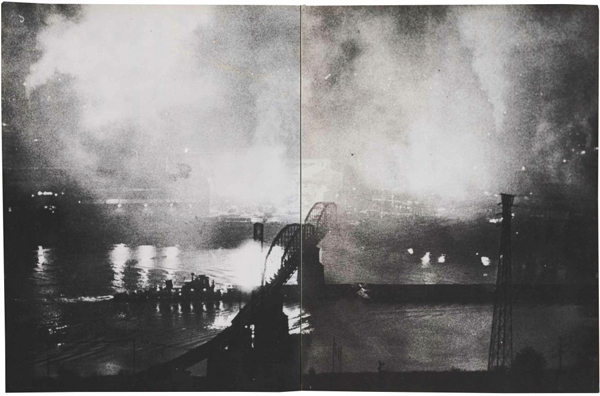 A week later, on September 9, Smith’s long-awaited extended essay on the city of Pittsburgh hit newsstands in Popular Photography’s Photography Annual 1959. It was the culmination of a three-and-a-half-year odyssey that began with a three-week assignment and led to 22,000 exposed negatives, two thousand of which he said were “valid” for his essay. He staked his reputation on the work, evoking Joyce, Faulkner, Tennessee Williams, and Beethoven, among others, as influences for the “layers” intended in his Pittsburgh layouts. Two consecutive Guggenheim fellowships (the first one coinciding with his friend Robert Frank’s fellowship for the work that became The Americans) further raised expectations. After turning down $20,000 from both Life and Look magazines when they would not agree to his demands for editorial control, Popular Photography offered to put thirty-six pages of their Annual 1959 at his disposal for $3,500. Smith accepted. But Deschin also cited the spread’s challenges: “Some readers may object to the details of the layout, such as the use of small pictures, rather than fewer and larger.” Smith had crammed eighty-eight images into thirty-six pages, along with a not insignificant amount of text. Additionally, the trim size of the Photography Annual was 8.5″ x 11″, compared to 11″ x 14″ at Life, where Smith had spent the last twelve years. His desire for meditative visual sequences had outstripped the available format. In Pittsburgh, Smith had met a young avant-garde filmmaker named Stan Brakhage, who had been hired to make a film commemorating the city’s bicentennial. The two hit it off instantly. Each admired the other’s dedication and belief in the power of seeing, which, they both thought, was so often tainted by commercial pressures, popular culture, and human fears. Brakhage used Smith’s stills in his cut of the film (a cut never released and unavailable today; another director finished the film), and his cinematic philosophies spurred new ideas for Smith’s Pittsburgh layouts. In Geneva, Smith shared a chalet with Brakhage, who was also there to document “Atoms for Peace.” They attended the conference by day and shared Scotch and conversation in the chalet by night. The thirty-nine-year-old Smith craved the fertile, boundless, uncompromising engagement offered by twenty-five-year-old Brakhage, who, in 1958, had completed the film Anticipation of the Night, which he’d considered ending with the scene of his own suicide, a thought that would have thrilled Smith. It’s at this point that the biographical enterprise falls short; the true impact of the relationship between Smith and Brakhage can only be speculated. In June of 2003, I interviewed Carole Thomas, Smith’s girlfriend with whom he shared his Sixth Avenue loft from 1959 to 1968. She told me that “Gene was intrigued by this avant-garde filmmaker” but couldn’t recall his name. Wonderful how clearly your face comes to me the instant I type your name — your face … its particular intensity: and then I have a shift of backgrounds including the kitchen in that damn Swiss chalet, the nightmarish Atoms For Peace circus, and then most happily your loft in N. Y. — your face remaining a constant thru all this, weathering these scenes with an etch of grace: see, I’ve almost got a motion picture portrait out of these memories. In connecting dots between Smith and Brakhage, that’s all that I’ve found. But I believe that much about Smith’s next large-scale project can be gleaned from this small amount of information. Smith returned from Switzerland embarrassed by Pittsburgh but emboldened to go even further with his ideas for sequencing still images. He embarked on a two-volume, 350-page retrospective book that eventually contained 450 photographs spanning his career to that point. It became known, properly, as “the Big Book.” It could also have been called “the unpublishable book,” the dummy, or maquette, of which was accessible only in Smith’s archive until an extraordinary facsimile of it was published last year by the University of Texas Press and the Center for Creative Photography at the University of Arizona. Brakhage felt that words deadened the senses; the majority of his films are silent. Smith had strangled his Pittsburgh layout with overwrought text (“Steeple and microscope – how will they flourish in common?”); The Big Book contains no text. It opens with tender pictures of children, including Smith’s own, and closes with brutal images of carnage on the front lines of World War II, an arc Brakhage would have admired. In between there are some two dozen of his iconic images from Life magazine, and many more that are rarely, if ever, published in Smith monographs, including some of the most abstract and ephemeral work of his career, all woven together with no concern for chronology, subject, or theme. Images from the photo essays “Country Doctor” and “Nurse Midwife,” for example, aren’t confined to discrete sections. Journalism was thrown out the window. There was also no concern for making commodities of individual photographs, a growing trend in the art world at that time. What matters most in The Big Book are shapes and rhythms, patterns of tones, and an underlying sense of the foibles of human culture—the hungry, blind march toward death, often at the political and economic hands of fellow humans. These are all ideas Smith and Brakhage would have discussed over Scotch during those long nights in the Swiss chalet. The Big Book represents Smith’s most fully formed ideas for layout. Unrestrained by the strictures of print journalism, rejuvenated by Brakhage, Smith produced what would be the pinnacle of his sequential aesthetic. The achievement owes much to Carole Thomas, who wandered into Smith’s life as a soft-spoken, eager, and brilliant art student in 1959 and stayed for nine years. Only seventeen years old, she already had a background in theater design, which made her the perfect partner for Smith, who often claimed theater was his most important influence, not photography. Thomas absorbed Smith’s impassioned aesthetics and adopted his dedication to The Big Book. She became the thoughtful sounding board he needed in order to finish projects at this stage of his life. On the voluminous tape recordings Smith made in his loft, he and Thomas can be heard discussing layouts for The Big Book for many hours; her aptitude is clear. She also became a masterful darkroom printer in her own right. She was integral to Smith achieving the most audacious product of his career. It would be her unseen opus, too. A half century after Smith finished his two-volume maquette, the Center for Creative Photography and University of Texas Press made a bold, complicated decision to publish a facsimile of the surviving original, rather than redesigning a new book based on it, by inserting pristine reproductions of Smith’s images in place of the maquette’s Agfa Copyrapid reproductions (essentially fifty-year-old photocopies of Smith’s original prints) that weren’t meant for publication. A third volume includes thumbnails of all 450 images made from Smith’s original prints, or negatives when his prints weren’t available, proving that they could have done what they chose not to do. You can hear cynics decrying, I want to see Smith’s vaunted printing technique represented here, not glorified photocopies, and certainly not for $185! But the right decision was made. This version gives life to an archival object, offering an opportunity to get as close to the work of Smith and Thomas as possible (short of holding the original maquette in our hands). Despite his facility, Smith was never about the precious print anyway. It was another of his contradictions. He was more about effort than outcomes. Sam Stephenson is a writer working on a biography of W. Eugene Smith for Farrar, Straus and Giroux. He is also a partner in the documentary company Rock Fish Stew Institute of Literature and Materials, based in Durham, North Carolina. Excerpt from The Big Book by W. Eugene Smith (Copyright © The Arizona Board of Regents, University of Arizona, Center for Creative Photography; photographs © 2013 The Heirs of W. Eugene Smith) used by permission of the University of Texas Press.